Members of the Iowa House are wearing ribbons today in honor of a woman who died of a rare form of breast cancer last Friday. Thirty-five-year-old Mary Chinnock, the daughter of State Representative Jane Bloomingdale of Northwood, was diagnosed with inflammatory breast cancer. State Representative Shannon Lundgren of Peosta says there’s no lump with this type of cancer. Several House members, including Lundgren, are driving to Eden Prairie, Minnesota, to attend a visitation for Mary this evening and the funeral tomorrow morning. Josh Wilson, a clerk in the Iowa House, came up with the idea of distributing ribbons to everyone on the House floor today. 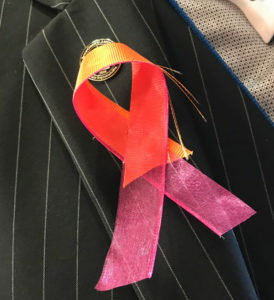 The ribbons Wilson distributed today are pink and orange, with a little black intertwined. It’s a design developed by an Inflammatory Breast Cancer awareness group.